We are all reading different editions of Alice but for those of you who are reading the annotated version you will recognize Mr. Gardner's name as the author of that version. Happy Birthday to Mr. Gardner who turned 95 this past October! 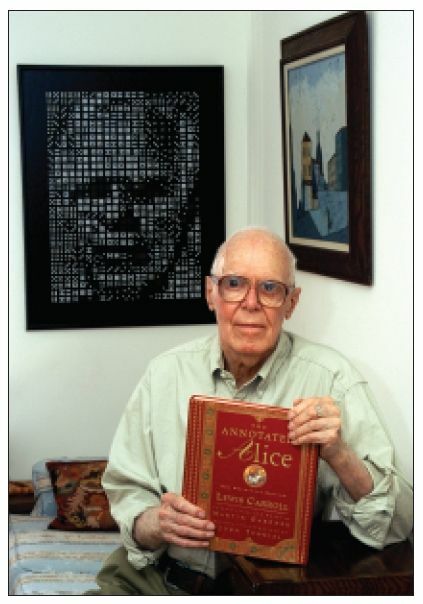 Martin Gardner was born October 21, 1914, in Tulsa, Oklahoma. He is an American mathematics and science writer specializing in recreational mathematics, but with interests encompassing micromagic, stage magic, pseudoscience, literature (especially the writings of Lewis Carroll), philosophy, scientific skepticism, and religion. He wrote the Mathematical Games column in Scientific American from 1956 to 1981, and he has published over 70 books. Gardner had problems learning calculus and never took a mathematics course beyond high school. In 1956 there was a children's magazine in New York named after a giant egg, Humpty Dumpty, who purportedly served as its chief editor. Dumpty was assisted by a human editor named Martin Gardner, who prepared "activity features" and wrote a monthly short story about the adventures of the child egg, Humpty Dumpty Jr. Another duty of Gardner's was to write a monthly poem of moral advice from Humpty Sr. to Humpty Jr. At that point, Gardner was 37 and had never taken a math course beyond high school. He had struggled with calculus and considered himself poor at solving basic mathematical puzzles, let alone creating them. But when the publisher of of Scientific American. asked him if there might be enough material for a monthly column on "recreational mathematics," a term that sounded even more oxymoronic in 1956 than it does today, Gardner took a gamble. He quit his job with Humpty Dumpty. Martin Gardner occupies a unique position in the mathematical world. The author of the 'Mathematical Games' column that ran for twenty-five years in Scientific American magazine, he opened the eyes of the general public to the beauty and fascination of mathematics and inspired many to go on to make the subject their life's work. His column was the place where several important mathematical notions, such as Conway's Game of Life and Penrose tiles, first became widely known. It was also a place where the sheer fun of mathematical games and puzzles was celebrated and savored. His crystalline prose, always enlightening, never pedantic, set a new standard for high quality mathematical popularization. In 1987 he received the AMS Steele Prize for Mathematical Exposition "for his many books and articles on mathematics and particularly for his column 'Mathematical Games' in Scientific American." He began his Scientific American column in 1957. In November 1958 he chose Squared Squares as the subject of his Mathematical Games column and the 33 x 32 squared rectangle of Z Moro'n was featured on the magazine cover. William Tutte wrote an article for the column on how the square was squared by himself and his Trinity undergraduate colleagues, Brooks, Smith, and Stone. Martin Gardner revisited the topic of square tilings and squared squares several times in his column and books. As important discoveries were made, Gardner reported the findings, and informed and inspired amateurs and professional mathematicians alike. In 1981, on Gardner's retirement from Scientific American, the column was replaced by Douglas Hofstadter's "Metamagical Themas", a name that is an anagram of "Mathematical Games". In the early 1990s he retired to Hendersonville, North Carolina, from where he continued his prolific writing career. A man of wide interests, Gardner is the author of over fifty books. In 2002 he moved to Norman, Oklahoma, near University of Oklahoma, where his son, James Gardner, is a professor of education. He has never really retired as an author, but rather he continues to do literature research and to write, especially in updating many of his older books, such as Origami, Eleusis, and the Soma Cube, published 2008. The best way to learn about someone is to read about them in their own words. The following is a link to an interview Mr. Gardner did with a professor at Cambridge University in 2008. I remember the Humpty Dumpty magazine. I will have to thank him for the annotated version of Alice which made it so much more interesting to those like me who always want to know the thoughts behind the story. Sometimes the author or what compelled him to write is more interesting than the story. I am just part way through the interview but I have to say I am enjoying this tidbit enormously. What an interesting man! Martin Gardner is a joy. He somehow manages to make mathematics and language complementary. I've always been seriously distracted by logic and number games, but didn't get far in school. Gardner has always been a sweet outlet. Great language, accessible problems, AHA! thinking - I'm in heaven! His The Universe in a Handkerchief plays with Carroll's math and language as if both men were face-to-face (probably smiling with delight). It seems so odd to me that he would write a column on math. But then Carroll was a mathematician also. If you can find My Best Mathematical and Logic Puzzles or any other of his titles published by Dover, you'll see the connections. I wish I could but I am just not wired that way! How can I entice you all into the world of recreational math? It sounds daunting, but you do it every day. Geometrical puzzles are just how you move things in space (put groceries in the car lately? ), numerical puzzles are about patterns. Sorry. I'll step off my soap box in a minute, but..[b]read Martin Gardner[/b]. One of you, at least, will be delighted. I'm going to check it out, Buster, if I have time. I actually do have somewhat of an affinity for numbers. I have an easier time remembering phone numbers than people's names. But logic is not my best suit. You may have given me my best Xmas present ever. I brought out all of my Gardner and Dudeney books of puzzles, and am in heaven. I'm saddened to write that Martin Gardner died on May 22, 2010. Martin Gardner, 95, a journalist whose omnivorous curiosity gave rise to wide-ranging writings that popularized mathematics, explored theology and philosophy, debunked pseudoscience and dug into Lewis Carroll's beloved children's books with the gusto of an investigative reporter, died May 22 at a hospital in Norman, Okla. Thanks for letting us know, fansmom. I'm just coming back from a trip and catching up. Very sad news indeed. Thanks for updating us, fansmom.